Greetings! We would love to introduce you to a special program that we have at Queen Creek Elementary School, the Soaring Eagle Recognition Program. There are so many Queen Creek Elementary employees and volunteers who devote their time, energy, and passion to our children and to their success. Unfortunately, we don’t always have the opportunity to tell these good people thank you. Author, Cynthia Ozick, once wrote, "We often take for granted the very things (the very people) that most deserve our gratitude." 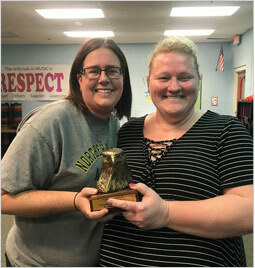 To this end, the Soaring Eagle Recognition Program gives students and parents the opportunity to say “Thank you!” to some very special people, while also providing them with a bit of recognition for their efforts. Once a month, we will be drawing a recognition form out from those submitted and awarding that particular staff member or volunteer with a prize. On the right side of this web page, please find a copy of the recognition form for submission. These forms can be filled out and emailed, or printed out and dropped off in the front office. We feel confident that with your support, this program will continue to be a huge success! By the way, if you would like to donate a prize of any kind (a restaurant gift card, a gift card for a pedicure, gift basket, movie tickets, etc. ), your donation would go a long way towards the success of this program. Please contact the Queen Creek PTO via email if you have a donation. We thank you for your support! Thank you in advance for all that you do to make Queen Creek Elementary an extraordinary place for kids to learn!